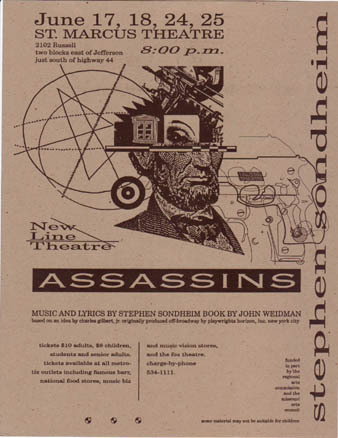 Assassins is a musical character study of the men and women who have tried to kill U.S. presidents, and of the reasons, obsessions, and protests that led each of them to this extreme act. Some did it for political reasons, others for personal reasons, others still because they were genuinely crazy. The show's creators don't ask you to sympathize with the assassins, only to spend some time with them and realize that they are real and complicated people – much more than faceless “assassins.” They are as much a product of their times and of our American society as any one of us. When we wonder why kids are killing each other on our streets, we would do well to listen to these nine Americans. Their feelings of impotence, powerlessness, and unfulfilled dreams are the feelings so many of us experience today. The message that any one of us could become one of the characters onstage is unsettling but truer than we might want to believe. This is an unusual musical not just because of its subject matter, but also because of its structure. In many ways, it's more a revue than a traditional musical, a revue of songs and scenes ricocheting back and forth through American history. Some are outrageously funny, some frightening, some deeply moving; like America, Assassins is a melting pot. Strolling through it all is a Balladeer, the personification of the stories, myths, and songs that we pass down generation to generation. Composer Stephen Sondheim and playwright John Weidman propose that many of these assassins were inspired by the stories of those who went before them. To dramatize this, John Wilkes Booth actually suggests to Zangara in 1933 and Oswald in 1963 that they kill the president. The shooting gallery proprietor who sells guns to the assassins in the opening scene perhaps represents a country where easy access to guns and a too-hyped American Dream makes these nine people see only one alternative to their problems. Booth and the other assassins sing, “Everybody's got the right to be happy.” They believe that their guaranteed right to the pursuit of happiness also guarantees them the right to attain that happiness – which is something altogether different. When the mythic American Dream eludes them, they feel cheated, ignored, stepped on. Earl Warren said, “The only thing we learn from history is that we do not learn.” We'd like to think that isn't true. We think that by understanding these nine people, we may be better equipped to help others like them – before they become killers. So enjoy the show, and when the assassins ask you in the song, “Another National Anthem,” to join them, imagine just for a moment the fame, the attention, the chance to change the world. And then be thankful that the pressures of our modern world haven't pushed you to that extreme. Yet. Read director Scott Miller's background and analysis essay about Assassins. One of the more colorful members of the cast was Michelle Laflen. Assassins is a very intense show, and as opening night approached, the cast was concerned about their ability to impart the deep emotional intricacies to the audience. Luckily, Michelle's boyfriend Kenny started coming to rehearsals about a week before the show opened. You see, when you've been through a script fifty times, it's difficult to judge its impact. Having a new person experience the production always brings a fresh perspective. Well, almost always. One night, at the conclusion of the rehearsal and the subsequent (and generally lengthy) notes, I hopped down off the stage and began to look for my things to gather before leaving: car keys, jacket, script. My script was missing. I said, “Hey, does anybody know where my script is?” Michelle responded, “Oh Kenny has it. I think he's in the bathroom.” I said, “He can keep it.” But I digress. As the cast gathered in the green room before the final dress rehearsal, Michelle spoke up: “Hey, everybody. I just wanted to let you know the show is really great. Kenny said so. He's never emotional, but last night he got choked up watching rehearsal.” Oh great. We know we're a success gang – Kenny wept. During the Copland-esque singing of “Big Bill,” Kevin Collier as Leon Czolgosz waited in line to meet President William McKinley at the Great Pan-American Exposition in Buffalo. The line of folks (Leo, Michele, Laura, and that one boy) extended downstage from the invisible President upstage to Czolgosz, who was waiting not to shake the President’s hand, but to assassinate him. Tech week came, and Kevin and the other gun-totin’ assassins were given starter pistols to use. They created a pretty good bang when they went off. For the McKinley assassination, Kevin and his gun were to make it to the head of the line for the climax of the song when Czolgosz, on an abrupt musical caesura, would shoot the President. But it never failed—or rather, it always did. During every dress/tech, Kevin moved to the head of the line, aimed the gun towards the audience (where the invisible McKinley stood), and pulled the trigger. Nothing. The first couple times were funny. But when it happened repeatedly—the gun working perfectly before the rehearsal, then not working at such a crucial moment—well, let’s just say Kevin’s goddammits and other choice expletives became more and more explosive. And from the point of view of the success of the moment in the show, it certainly made all of us nervous. However, most of us stifled peals of laughter when we considered the possibility of rewriting the show—and American history--so that Leon Czolgosz, instead of assassinating William McKinley, just looked at him, real mean-like, and gave him a good cussin’ out. The first time I directed Assassins was the greatest thrill of my life. It was the first time I had directed a show that was truly a masterpiece, the first time I really submerged myself fully into a show, lived it, slept it, thought about nothing else. We had a very talented cast and it turned out so well. Even my mother, who I expected to hate it, found it compelling and mesmerizing. It was the first step in her conversion to the person who now prefers Floyd Collins and The Cradle Will Rock to Brigadoon and Hello, Dolly. Assassins is the bravest show ever written, a masterpiece of subtlety, of characterization, of confrontation, of psychology, of pure, brazen theatricality. It was terribly disturbing to watch and it unnerved each audience through its stubborn refusal to judge these assassins, to take the easy, safe road. It let each assassin speak for him- or herself. Some of them were clearly crazy, but some of them were clearly not – and that was the most disturbing thing of all. The message of Assassins is that the people who try to kill presidents are more like you and me than we’d like to believe. It’s a message most people don’t want to hear, but it’s one everyone should hear. Ultimately it thrilled audiences every night and was New Line’s first genuine triumph, as if our little company had finally grown to full maturity. It was a turning point for New Line and for me, both artistically and personally. The other reason Assassins was special to me, personally, is that early in the rehearsal process, my position at my “real job” was eliminated and I found myself unemployed for the first time in my life. My search for a new job was admittedly half-hearted because I discovered the incredible joy of dedicating my time fully to a show. No more did my job get in the way. No more did I have to work on the show only after work. Now it was my work. This was when I realized I was meant to be a freelancer. And I haven’t had a traditional desk job since then. One more note. I honestly believe that every high school in America should be forced to produce Assassins every four years. With gun violence in our schools reaching epidemic proportions, we must try to understand why people get angry, why they feel left out by the American Dream, why a gun makes them feel empowered – all issues addressed eloquently and intelligently by Assassins. This is the one show that could start a dialogue that might lead us to some real answers.